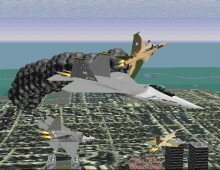 "The game used the same engine as USNF, with updated aircraft shapes and terrain. Though it was still unrealistic like USNF, ATF was very fun because of its customizability and multiplayer gameplay options. Replay value was high, with 2 campaigns, lots of single missions, an in-game mission creator, and a quick mission creator. Replay value was further increased by Duosoft's toolkit, which allowed players to easily and greatly modify the game with custom addon libraries. The game focused on futuristic aircraft and campaigns, with many of the flyable aircraft still in development. Every aircraft from USNF was kept, with lots of new planes and some new weapons. One of the new features was a comprehensive Jane's research suite on all the game's aircraft, weapons, vehicles, ships, etc." If you liked USNF, there is no reason you wouldn't like this new and improved sequel. The range of aircrafts you can fly alone makes this sim well worth a look for any fan of the genre.